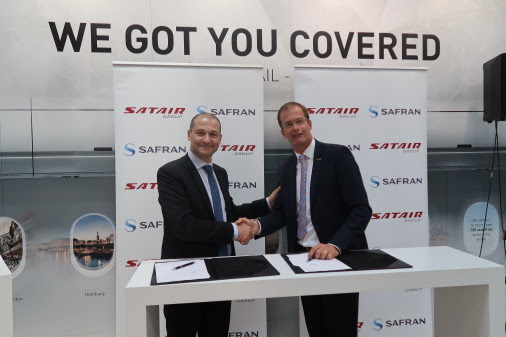 Satair Group has signed its first major contract with Safran Nacelles, covering global lifetime supply chain services for engine nacelle parts and components used on Airbus A340-500/600 jetliners. Under the terms of the agreement, Satair Group has now assumed responsibility over Safran Nacelles’ entire supply chain for the A340 nacelle elements, carrying out support duties through the lifetimes of the four-engine aircraft. There are currently 90 A340-500/600s in operation, and Satair Group estimates the aircraft type will remain in service beyond 2030. A physical transfer of Safran Nacelles’ A340 nacelle parts inventory has been made from the company’s Paris support center to Satair Group’s Copenhagen facility. Safran Nacelles will continue a direct working relationship with its A340 customers for overall customer support, nacelle maintenance and repair (MRO) services – as well as engineering support. The A340-500/600 nacelle was the first such system completely designed and supplied by Safran Nacelles, elevating it from a component manufacturer to a nacelle integrator.